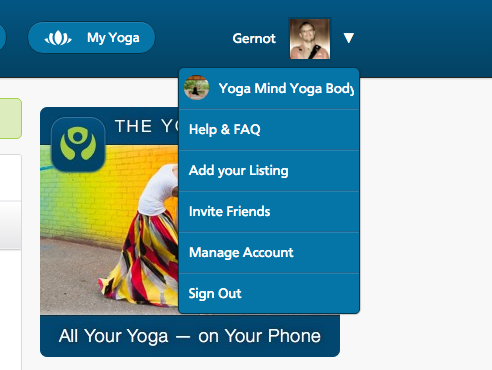 1st thing you need to know: creating and maintaining any kind of profile on YogaTrail is free. Every person on YogaTrail has a personal profile, which may be either a yogi profile or a yoga teacher profile. So if you create and manage a venue profile, you'll also have a separate personal profile. Yogi (regular member) profiles are for folks who are not yoga teachers. This type of profile is not searchable on YogaTrail and so it doesn't show up anywhere in search results. Yogi profiles also can't create and publish events or get reviewed. The name of the profile can be anything you wish (Yogis are known by their username, which doesn't have to be your real name). So why do you need a personal profile at all? Well, to review anyone on the site, you must be registered (to protect the businesses listed from spam and questionable reviews.) Yogis can also follow their favorite teachers and places on YogaTrail, so when you log into YogaTrail you'll see all your personal yoga options and favorites at a glance. If you have a Yogi profile, but would prefer to be listed as a teacher, or if you want to add a yoga venue that you manage, you can do that easily by adding your listing here. Note: creating a teacher profile will replace your yogi profile. This is a professional yoga provider profile - but since it's also a personal profile, yoga teachers can also follow places, write reviews, and have their own Class Guru and News Feed. A yoga teacher can also manage one or more separate venue profiles. Note: Yoga Teachers must use their real name on their profile, and every teacher must manage their own profile. A single person cannot more than one personal profiles (just like in real life), so (a) you cannot manage another teacher's profile, and (b) 2 different teacher profiles cannot be merged into the same account. Sorry. Yoga venues are places that are open to the public and offer yoga regularly. On YogaTrail, these are listed either as Yoga Studio or Yoga Retreat Center. Teacher training schools should use Studio as their venue. Only Yoga Studios can post classes, since Yoga Retreat Centers aren't usually places where yogis can just 'drop in' for a yoga class. You can have more than one professional profile (so for example, a teacher can also manage one or more studio profile, or a yogi can manage a studio and a retreat center). However, no one can have more than one personal profile. Again, just as in real life, you can only be one person at a time! Navigate between your various profiles by using the drop-down menu at the top right in the header (small triangle next to 'My Yoga’). Events can only be created from a professional yoga provider profile (teacher, studio, or retreat center). Here's how.